Dog wheelchairs (also known as dog carts) are one of the biggest investments that we make to improve the quality of life for our paralyzed dogs. Our dog wheelchair review is designed to ensure you find the right wheelchair, first time. Making the choice between the different dog wheelchair brands can be quite a leap of faith. Most of us have never seen a dog wheelchair in person, let alone had an opportunity compare different brands side by side. These Dog Days recently surveyed existing customers of the five most popular dog wheelchair manufacturers. We collated this feedback to produce independent reviews of the various dog wheelchairs as well as a handy buyers guide which you can download and share for free. We have compiled a free dog wheelchair buyers guide with all of the facts and figures for five major brands; Walkin Wheels, Ruff Rollin, K9 Cart, Eddies Wheels and Huggiecart. Download your free copy below. Our guide is aimed at providing all of the basic information to help you chose the right wheelchair for your dog. Once you have downloaded your guide, scroll down to see our review of the main wheelchair manufacturers and customer feedback for each brand. By far the most popular brand of dog wheelchair, Walkin' Wheels by Handicapped Pets produce a sturdy wheelchair manufactured overseas and shipped from the USA. Being fully adjustable, there is much more forgiveness in the online fitting and ordering process. They have a much higher resale potential if your dog no longer needs the wheels. Standardisation can impact on the final fit when compared to a custom built wheelchair. All sizes are available in three colours; pink, blue and camo. There are a range of different front and rear harness options available as upgrades to suite your dog's size and shape. 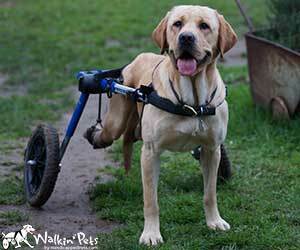 What we think: Walkin' Wheels provide good value for money and will suit dogs of all sizes and shapes. However, if your dog has unique requirements you would be better served by a custom built option. Ruff Rollin offer custom built dog wheelchairs made in Montana, USA. Each wheelchair is custom made for the dog with components and design adjusted to suit the the dog's dimensions, weight and disability. For example, lighter weight plastic components can be used for very small dogs. Despite the customised nature of the end product it is also adjustable if further changes are required at home. Ruff Rollin also guarantee that the wheelchair will fit your dog. Ruff Rollin wheelchairs generally come with higher quality wheels, rear saddle and harness than their competitors which adds up to a higher price tag. However, in addition to the quality you are also buying a lifetime warranty on the frame and wheels which not many alternative brands offer. What we think: We think Ruff Rollin offers a top end dog wheelchair and great customer service. A great investment for your pooch! Most popular brand for front wheelchairs. Lifetime warranty on frame and wheels. Return within 20 days for 80% refund. K9 Carts are the original dog wheelchair manufacturer, having first started out in 1961. Their team includes orthopaedic and mobility impairment specialists who previously ran the largest veterinary orthopaedic hospital in the USA. K9 Carts offer fully customised dog wheelchairs that are the lightest on the market. Their wheelchairs use a unique front harness that relies only on a shoulder and rib strap. This design makes putting your dog in the wheelchair a bit quicker and easier than other brands. The narrow wheel base makes K9 Carts a great option for dogs who spend most of their time indoors, navigating furniture, but less suited to rough terrain outdoors. Eddies Wheels are one of the most popular manufacturers of custom built dog wheelchairs. 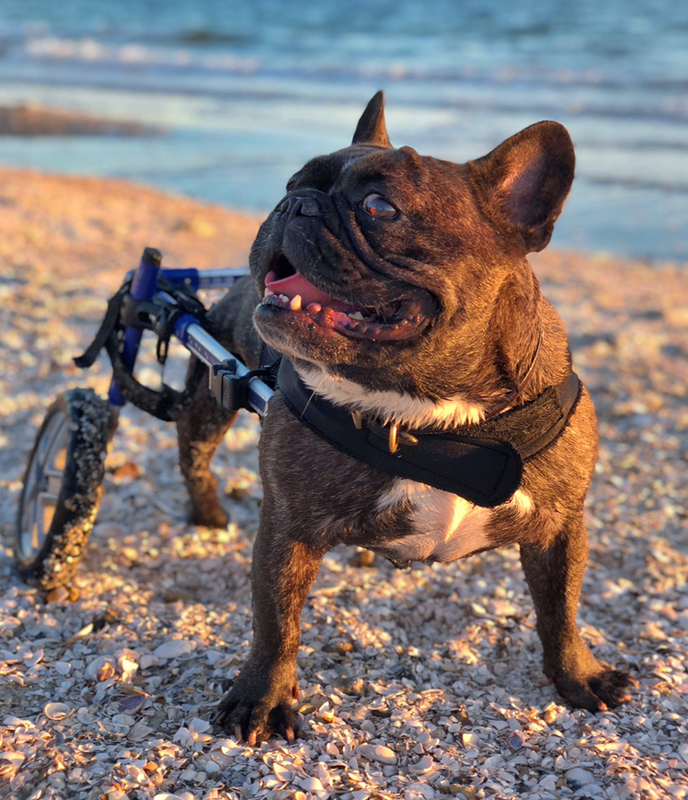 Founded by mechanical designer and inventor, Ed Grinnell, and wife Leslie, Eddies Wheels build custom wheelchairs for every dog. The wheelchairs are fully customised your dog and are designed to balance your dog's weight to take the pressure of the shoulders. As a result, Eddies Wheels do not require a front harness, instead it uses a solid shoulder bar. All owners of Eddies Wheels dog wheelchairs who were surveyed recommend the brand to others. Amazingly, only 6% of owners reported any quality issues after buying the wheelchair.